There are some new fish in the sky and hunting them is not so easy - instead of just catching them with your plane you have to use harpoon to drag them to your base on Granaria. The second update brings also some new features steam community asked for: possibility to use relative controls (instead of default absolute steering), weapon's cooldown visualization, clear indication of health loss, timer for weapons from weapon crate and more! Airheart will also dig into some powerful social themes: Amelia is an immigrant to "the Above," reaching it only after a perilous journey through the desert with her father and learning quickly after her arrival that it is not as warm and welcoming a place as it seemed. There has been a rare sighting above Granaria! A Minke whale is roaming the space above the city. Fishermen's dreams have awakened. Who will be the one to defeat the giant and bring it back down? A friendly and highly-valuable large fish inhabiting the higher skylayers. Some say it isn't even a fish, but who knows. Instead of Amelia just vanishing when returning and crashing, you can now see her getting back down. Does this help you in any way? Not really... but at least it should make it more clear why you lose your airplane. New randomization, new values, new balancing. The universe has changed, so have you. Everything you owned is gone. You have to start anew. But we believe in you! 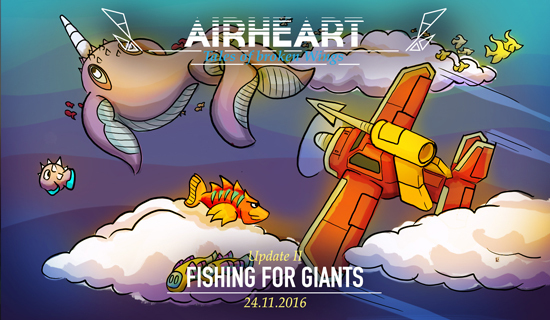 The Fishing For Giants content update also brings with it new randomization, new values, new balancing. The universe has changed, so game progress has been wiped. Everything player owned is gone.